When I first assembled my Abit BP6 motherboard, I had two small 60mm CPU fans, one per CPU heatsink. Since I overclocked the 366 MHz Celeron processors to 505MHz (92 MHz FSB), I replaced the generic fans with larger, more powerful, 60mm Panaflo fans. Over time, the added noise of the Panaflos started to annoy me. They weren't extremely loud - there are plenty of much louder fans out there; I just didn't like the noise. To make matters worse, I had placed a small 486 fan on the 440BX heatsink, thus adding to the noise. My solution was to replace all three fans with a single large 90mm Panaflo fan. My choice of fan was simple enough - I have a box of recycled parts and this particular fan was sitting there begging to be used. I wired it up to 12VDC and found it to be surprisingly quiet. Most important of all, it moved a massive amount of air. 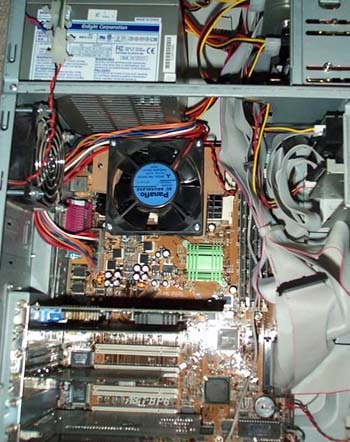 You'll notice that the fan is mounted to blow air down onto the heatsink. There's some debate over which airflow direction is better. For my use, it really didn't matter. What did matter was that this simple mount didn't provide enough support for the lower part of the fan which basicly just dangled. If I screwed the fan on tightly, I risked placing the rotating blades too close to the heatsink fins. With the majority of the fan unsupported, this led to the blades occasionally touching the heatsink - not a good thing ! Wanting a simple solution, I took some thin 1/4 inch plywood and cut two shims. The shims served several purposes. They seperated the fan from the heatsink to avoid the potential for contact. They covered the outside portion of the heatsinks - the parts not covered by the fan. This forces air to travel between the fins in those regions and through the fan for cooling. I reversed the fan and mounted it to pull air away from the CPU for this reason. They allowed me to tighten the screws on the heatsink to avoid vibration. They allowed me greater flexibility for screw locations. I no longer had to mount the fan at the far upper corner. Here's the resulting fan mounted over the heatsinks. 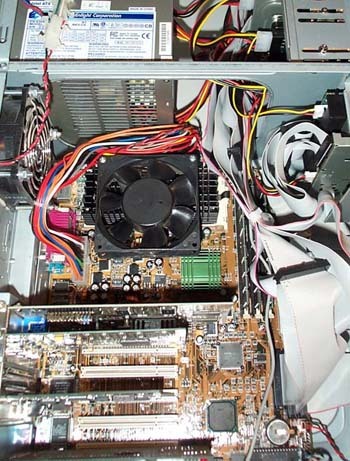 In use, the large fan circulates a lot of air over the motherboard, cooling not just the CPUs but also the 440BX chip (under the green heatsink) as well as the many voltage regulators around the processors. It I had to do it over again, I'd use a 120mm fan to make mounting even easier (it would cover both heatsinks), and run it at a lower voltage for even less noise.